Published April 3, 2019 By Leisa Good This post may contain affiliate links. Regardless, I only recommend sites I've researched and/or used and trust. Do you enjoy shopping in general and especially for other people? Are you quick and efficient and able to get what you need and get out of the store in a reasonable amount of time? Have you ever thought about what it might be like to be a personal shopper for someone else? If you answered yes to any of those questions, keep reading our Shipt review below! Shipt is a company that will pay you to grocery shop for others on your own time. 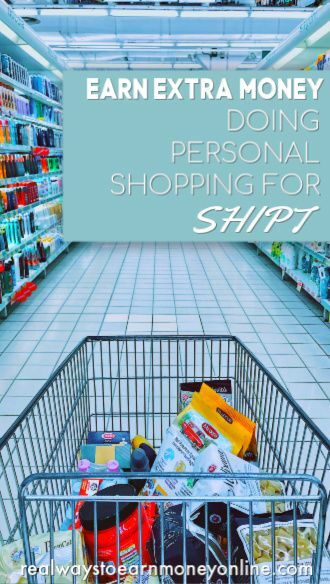 Shipt is a company that pays you to shop for groceries and household essentials for their members, many of whom are busy professional with limited time to do their own shopping. Through the app, members can shop for up to 40,000 items in one of several stores. Delivery is free if the customer orders over $35.00, but a $7 delivery fee applies if the customer orders under $35.00. Customers may also order from a selected store for an extra $.30 per item. In other words, it is best for the customer to stick to the stores in the membership. However, should the customer chose to deviate then they are liable to pay an extra $.30 per item. The company began in 2014 in Magic City, Birmingham, Alabama. Now in over 257 cities, Shipt strives to connect personal shoppers to customers really needing convenience. Which Stores Have Partnered With Shipt? According to eMarketer, it is predicted that by 2025, 40% of all grocery shopping will be done online. Shipt has a customer rating of 4.9 out of 5.0. So it seems that customers are willing to pay for convenience. What Is The Schedule For Shipt Shoppers? The hours are basically 24/7 if the store you have to go to is open at the time you accept an order. You may work part-time or full-time as a personal shopper and set your own flexible schedule. This is good for extra cash — something to add on as an extra income stream. Note that some areas may have restrictions on the hours you can work. In other words, no overnight shopping, which may be a bummer if you're a night owl. How Much Can You Earn as a Personal Shopper at Shipt? The company claims that you can earn up to $22 an hour, but this is based on 30 completed shopping trips. This means that you earn more as you become more in demand as a personal shopper. Most beginning shoppers report earning closer to $8 to $12 an hour. What Are the Requirements to Shop For Shipt? Be at least 18 years or older. Have a valid driver's license and auto insurance. Have a vehicle no older than 1997. Have a knowledge of the produce section in a grocery store. Have insulated shopping cooler bags. Be able to lift 40+ pounds. Have an iPhone (at least iOS 10) or Android (at least 5.1) smartphone. What Do Other Say About Shipt? Glassdoor gave Shipt a 3.8 out of 5.0. There were many happy shoppers working there and touting the benefits of being a shopper. Indeed gave it a 3.4 out of 5.0 review, and the College Review gave it a 4 out of 5 star rating. Usually anything 3.0 or over is good news. However, it is always wise to branch out from these sites and so some additional research before making a decision. Many shoppers seem to enjoy the work with the biggest complaint being all of the wear and tear as well as gas mileage racked up from shopping. How Do Interested Individuals Apply to Shipt? Just go to their website and click on the apply button. There will be an interview as part of the approval process. Once hired, you simply download their user friendly app to get started. Payment is once a week via PayPal.